There is a special kind of amnesia that comes over us every time we try and figure out what to have for dinner. They say most families eat the same 8-9 meals in rotation and with access to infinite inspiration on the website of gastric paradise that is Pinterest, why do we get so stuck in a rut? 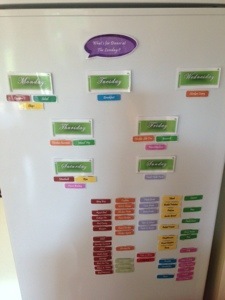 I began to research ways to plan and organise our meals. How hard could it be? Seven evenings a week, sometimes helped out with a takeaway or a meal out. Surely I could whip up a binder with recipes and ideas over-flowing? Well, it clearly works for some but my pathetic attempts to find time to find, print, punch and refer to recipes were nourishing no-one. What I really needed were ideas right there in my face! Not online, not in a cookbook, not even in a cutely decorated binder….in.my.face. 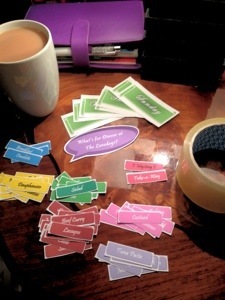 This is where I need it so that coming up with ideas was easy and everyone in the family could see the hymn sheet too – without having to ask for it. The key? The fridge door. 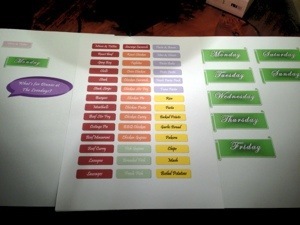 Impossible to ignore and the perfect, magnetic surface for ever-changing menus. Something each member of the family could see, use and choose from. 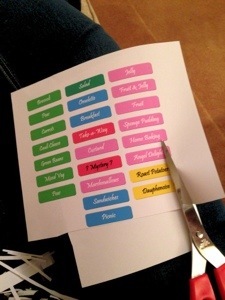 So, I set about to make it all myself, custom-made menus for our family. Step 4 – Voila! 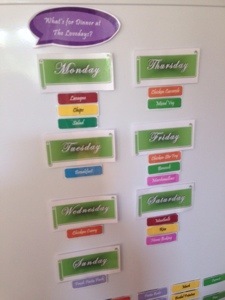 Have fun arranging them any way you like on the fridge!